i got this error. I am asking for steam version via w10. 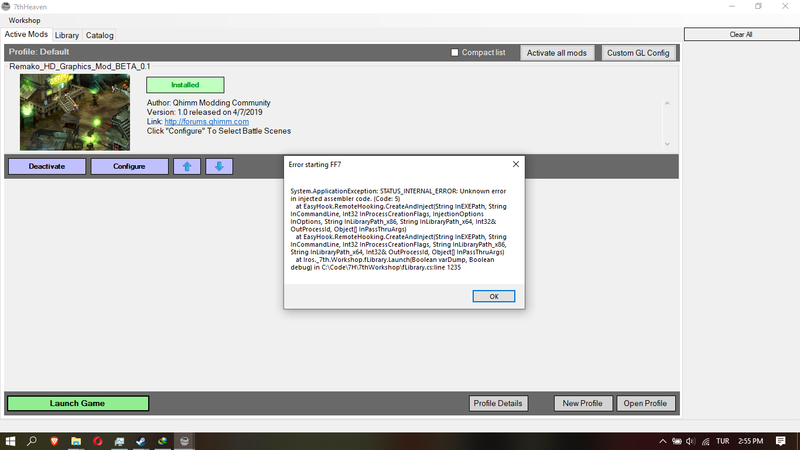 Windows 10 and 8, worst issues ever for older games, especially downgraded, older games.. Heck, some games are still troublesome and totally bugged on 7.. Here's a solution that should work. ➤ When I start FF7 I get an error message saying: STATUS_INTERNAL_ERROR [Code:5]. Right-click the 7thHeaven.exe and set the compatibility to run as administrator. Apply and close. Then find the FF7.exe you are using (ex. ff7.exe or ff7_bc.exe). Right-click and set compatibility to run in 640x480. Don't worry the OpenGL plugin will override this setting later. Go back into 7th Heaven and try launching the game. Setting compatibility to 640x480 is enough for me. I don't need to also run 7th Heaven as administrator. BTW, am about to start a playthrough but was wondering if I should hold off for the non-Beta release, if it's just around the corner?